The perfect Land Cruiser for a seaside escape. For decades, people have depended on the Toyota Land Cruiser to take them beyond the boundaries of the ordinary – to far-off places where they can escape the demands of the day and finally be free to roam. This Land Cruiser FJ43 is no exception. Impeccably restored and rebuilt, this FJ43 is ready to enjoy weekends in the Hamptons, amidst the area’s picturesque seaside villages. Before retiring to a life of leisure, this FJ43 paid its dues at a public utility company in Latin America. Later, it was sold it to an orange farmer, who used it to transport oranges and workers to various plantations. A Toyota enthusiast purchased the truck in its later years, changing its color from John Deere Green to Freeborn Red – which is how it arrived to us. Once this FJ43 was specced out and ordered by our client, we began a frame-off restoration. During the process, the engine, five-speed transmission, and braking system were overhauled to ensure everything would operate as it should. After sandblasting and powder-coating the chassis and frame, this FJ43 was repainted in Heath Grey, the perfect complement to the refurbished saddle-color upholstery. To top it all off, we replaced the after-market hardtop with one of our custom soft tops. This versatile rig is now ready to take on the beach or the mainland in style! 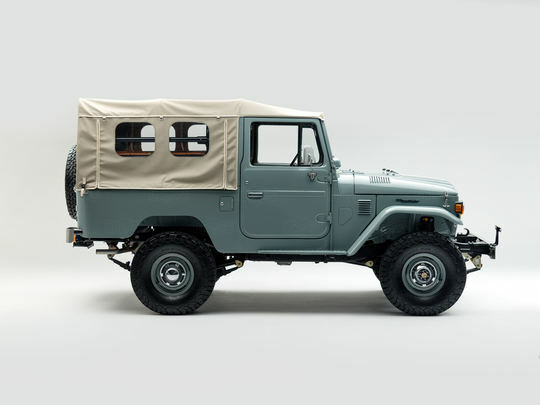 Produced from 1960 to 1984 in most markets, the FJ43 is like an FJ40 with a little extra cargo space. Look under the hood and you'll find the ever-durable F or 2F engine. This middle-wheelbase Land Cruiser comes in three main flavors: soft-top, hardtop, and van. It was never imported into the U.S. and is a worthy addition to any serious collector’s garage.